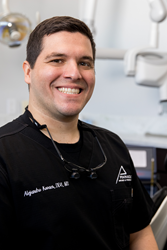 Dr. Alejandro Kovacs, dual-certified prosthodontist and periodontist in Texarkana, TX, lectures clinicians and their staff on full-arch dental implants for edentulous patients. Hosted by Straumann®, these lectures were held near Orlando and Tallahassee, FL. Dr. Alejandro Kovacs, esteemed prosthodontist and periodontist in Texarkana, TX, recently lectured for the dental implant company, Straumann®, through his course, ‘Restoring Edentulous Patients with Hybrid Solutions.’ Lecturing in Heathrow, FL, near Orlando, as well as Tallahassee, Dr. Kovacs provided local dentists and assistants with a unique opportunity to learn more about complex dental implant cases involving edentulous (toothless) patients. Dr. Kovacs is uniquely qualified to instruct on and place dental implants as he is one of four dual board-certified specialists in periodontics and prosthodontics in the United States. With over 10,000 hours of continuing education behind him, Dr. Kovacs is committed to learning, applying and sharing the latest in dentistry in order to improve patient care. Trained as both a prosthodontist and periodontist in Texarkana, TX, Dr. Kovacs has the experience and education necessary to both place and restore dental implants. He offers leading full-arch dental implant solutions to those patients without any teeth. Full-arch dental implants not only restore the aesthetics to the smile, but provide superior biting function, preserve jawbone health and are considered a long-term solution to tooth loss. Those interested in learning more about Dr. Kovacs or his practice can call Pinnacle Implants and Periodontics at 903-838-0511 for the Texarkana practice or 903-758-3329 for the Longview location and visit http://www.pinnacleperio.com for more information. Pinnacle Implants & Periodontics offers comprehensive periodontal care for patients in Longview and Texarkana TX. Dr. Alejandro Kovacs is a Diplomate of the American Board of Periodontology, the American Board of Prosthodontics as well as the International Congress of Oral Implantologists. As one of only a few dual-specialized clinician in the nation practicing as a periodontist and prosthodontist, he offers cutting-edge services including dental implants, laser gum disease treatment, gum recession care and full mouth reconstruction. To learn more about Dr. Kovacs, his team or the services they offer, visit http://www.pinnacleperio.com or call Pinnacle Implants & Periodontics at 903-758-3329 for the Longview location or 903-838-0511 for the Texarkana practice to schedule a personalized consultation.